Writing two blogs eats up a lot of time, especially when trying to maintain the rigorous discipline of generating one post per week per blog. Now and then, when my schedule demands it, I cheat. This is one of those times. I’m putting this post up on this blog two days late. Sorry. It’s also being published on my other blog two days early. While you could accuse me of double-dipping, using one post to take up two slots, it’s okay because the topic serves the distinct purposes of the respective target blogs. There. I’ve rationalized my sloth. Limping in the Light, deals with chronic illness, specifically MS. Scribbling in the Sand concentrates on my writing, including screenplays, which leads to an occasional movie review. What happens when those two worlds collide? Every now and then, a major movie is released that restores my faith in what film can do. This is one of those times. Here’s a movie about a realistic human being facing a realistic, if excruciating, fate: early onset Alzheimer’s disease. I’ve wanted to see this film for which Julianne Moore deservedly won the Oscar for Best Actress, but for some reason I just got around to it last week. It was worth the wait. Hollywood doesn’t get too excited about the chronically ill, the exception being mental illness, but only if said condition leads to exploitable sexual or violent behavior. We were fortunate to have two quality films about “disabling” illness recognized by the Academy for 2014, the other being “The Theory of Everything”. 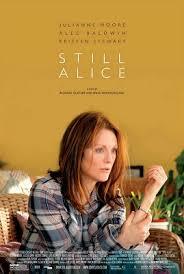 “Still Alice” accurately and vividly portrays the maxim that individuals don’t get sick, families do. Alice’s condition is almost as destructive to her family as it is to her. Yet it somehow brings about healing as well. How people react to sickness is as revealing as how it affects its victim. Not enough can be said about Ms. Moore’s performance. Subtle, powerful, gripping, disturbing, and true are all words that capture the essence of what she does on the screen. I felt her slow retreat into lostness almost viscerally. The “making of” featurette on the DVD was particularly enlightening as it dealt with how she prepared for her role. 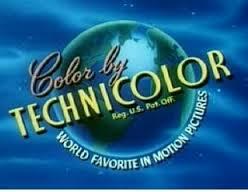 In any other movie, two characteristics found in this film would have upset me. It contained the obligatory puke scene and it easily toed the depression line that was de rigueur for most 2014 productions. Both were acceptable, maybe even mandatory in this context. I lambasted 2014’s bummer crop in a previous post, even mentioning this movie as an example. This is a film that will indeed be depressing for most, but the courage of battle can be uplifting as well. Don’t watch the movie for a lightweight escape. Watch it to be entertained in the best possible way. Watch it to learn more about this particular condition. 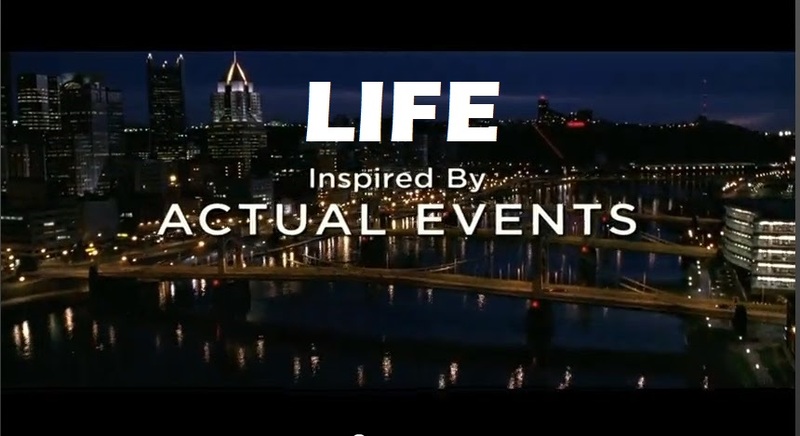 Watch it to develop more compassion for people dealing with disabling illness. Watch it for a master class in acting. Watch it because it’s not “Mortdecai”. Watch it to make the statement that not every movie has to have aliens and/or explosions and/or serial killers. With ten screenplays written and none sold or produced, you might think I’d be frustrated and angry. You’d be half right: It sure is frustrating. But angry? No point to that. Anger is a masking emotion and I’ve got nothing to mask. Most of the scripts I’ve written were more like learning experiences than realistic attempts to “break in.” I’ve learned a ton, thus improving my scripts and advancing my skills. So what do I do with all those lemons? Make lemonade. And you can have a sip. For the second time, I’m staging a reading of one of my screenplays. It’s not just for marketing purposes or ego gratification. This event will be a fundraiser for two causes, one near and dear to my heart – Haiti – and the other very near my brain but very far from my heart: MS. The first time I held one of these readings, also a learning experience and also a fundraiser, we raised almost $700 to serve as a micro-loan to a young entrepreneur in Haiti. The actual reading is on line in two parts. If you’re interested in watching the reading, the first part is here. I leave finding the second half as an exercise to the viewer. 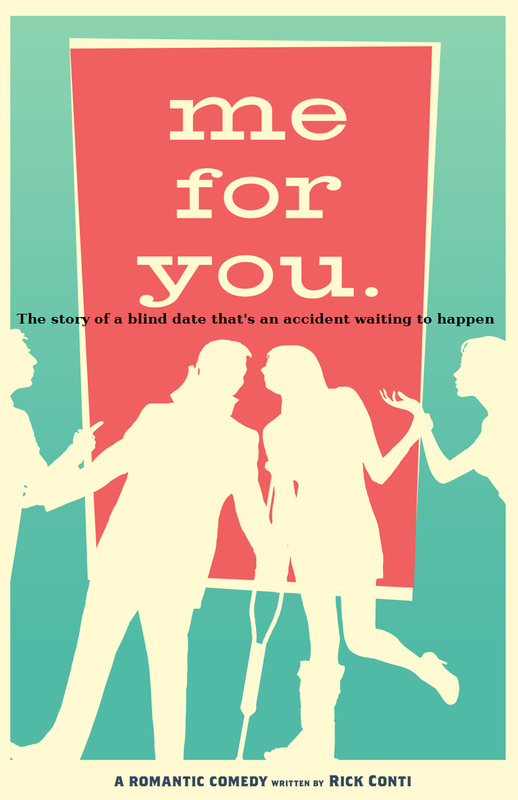 On Saturday night, April 18, at 7 PM, at the Chelmsford Center for the Arts, there will be a “staged reading” of my original PG-rated romantic comedy, “Me for You”. The cost is only $10 and includes chances to win cool movie-related door prizes. Snacks will be available for sale. Staged readings are common in the film development process as a way to promote unproduced screenplays. 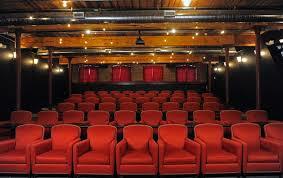 This script will be read live by actors in the intimate setting of the CCA Cabaret Cafe. You get a fun evening at the “movies”, help two great causes, and, if the script ever gets produced, get bragging rights as previewers. This year marks the 6th annual edition of this exciting event. The trivia is a blast – with yours truly (truly!) as the trivia jockey – and the silent auction is a collection of incredible buys, some one-of-a-kind. Funds raised this evening will benefit SFH‘s Biznis Pam program, which trains Haitian woman how to start and maintain their own businesses. Then they provide micro-loans to get the budding entrepreneurs going. This is a great program that deserves our help. Join me on Friday April 10, 2015, at 7 PM. For complete details, click here. This is a combination of three of my favorite things: Martha’s Vineyard, cycling, and raising money to crush MS. You can be part of this event by donating money to my ride or to my team. To donate to my ride, click here. To support my whole team, click here. If you want to go further in your commitment, you can ride with us. Register and join our team: The Vineyard Square Wheelers. Ride on! Here I sit in LAX waiting for my red-eye back to Boston. After nearly three weeks in Santa Barbara, CA, I’m hesitant to get on that aircraft. Back home, I’ve missed about seven feet of snow (actually, “I wouldn’t say I’ve been missing it, Bob.“) while relaxing in wall-to-wall days of 70’s and sunshine. They don’t call it the American Riviera for nothing. I’m trading in endless bike paths, ocean surf, and outdoor living for snowbanks, icicles, and a couple more months of cabin fever. While in SB, I had the opportunity to get a taste of the SB International Film Festival. Film fests are a great experience. I’ve only been to four settings: SB, Austin, Martha’s Vineyard, and Boston. (No Toronto or Sundance yet. Those are the Big Ones. Cannes and Venice are above my pay grade.) The first two are legitimate festivals. Austin is the “writer’s festival” and thus holds a special place in my heart. By comparison, the other two are low key. I can understand MV hosting a smaller event. 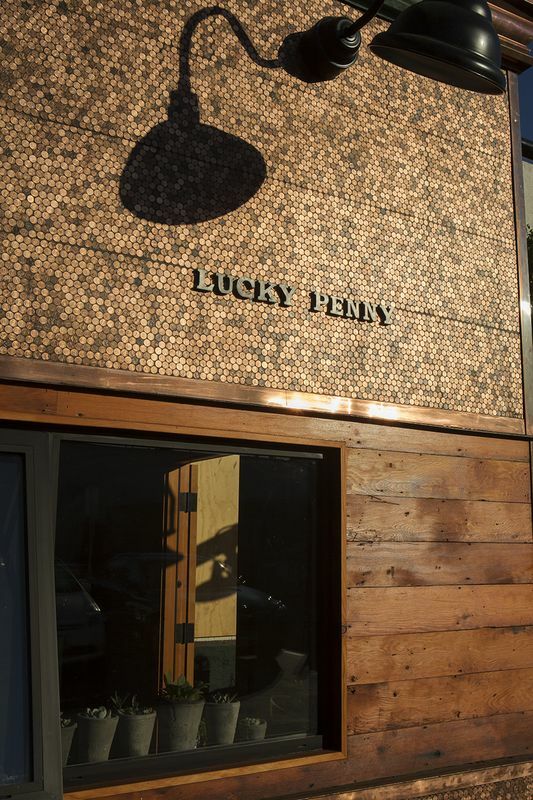 It tends to serve the local community rather than drawing large crowds from distant locations. You’d think, however, that a world-class city like Boston could pull off something more impressive. You’d be wrong. Fortunately, Austin and SB make up for it. The two cities have a lot in common besides hosting credible film festivals. They’re both funky, artsy, and warm – things I appreciate in a city. All Austin needs is an ocean built next to it and real estate values increased about 1000% and they’d be identical. 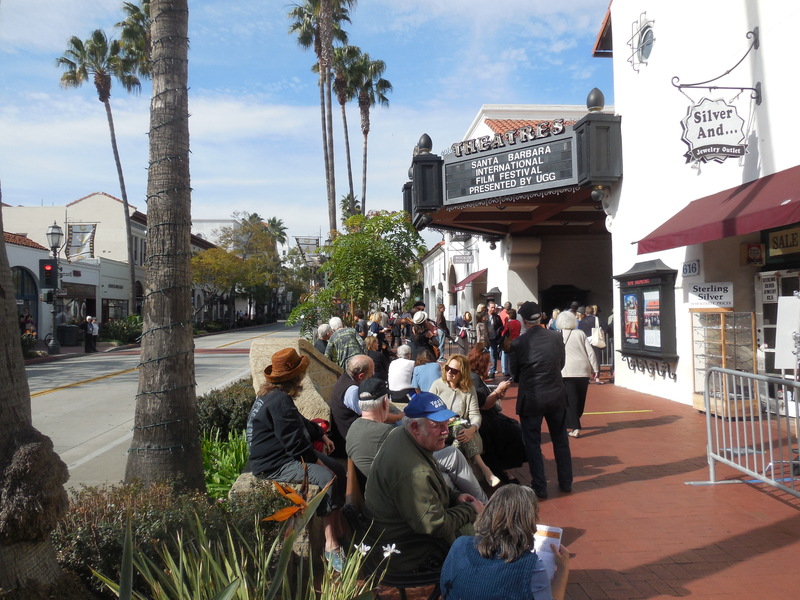 Santa Barbara is the perfect setting for a film festival. First of all, it was Hollywood before Hollywood was Hollywood. Second, it’s home (or home-away-from-home) to many film notables, e.g. Oprah, Jeff Bridges, Kevin Costner, Jennifer Aniston, and a People-magazine-load of others. The truth is I’ve never seen a single celeb here, but that’s just fine with me. And even more fine with them, I assume. What I did see are movies, some never before shown in America. Given my lack of time, transportation, and funds, I limited myself to only four of the dozens that filled the 12 day schedule: two Italian films and two Scandinavian. Interesting combination since those two ethnicities make up a significant percentage of my family’s background. A great thing about film festivals is that you can see movies that might never be seen elsewhere. Many films are showcased at festivals to find distribution. Many – even some good ones – never see the light of day… or DVD or streaming. It was a privilege to see them. Even the duds. Banana (Italy) was a comic but bittersweet story of a young Italian boy who obsesses about being a great Brazilian (?) soccer star, while wooing the older girl of his dreams. While trying to change his own life, the boy has a positive impact on those around him who have given up hope. I rated it a 3 out of a possible 5 on the film fest scale. It was worth seeing just for a couple of very funny gags. Mafia and Red Tomatoes (La Nostra Terra, Italy) recounted the true story of an unlikely motley group of volunteers trying to start a farming cooperative on land seized from the Mafia. They face opposition from within and without. With equal parts social commentary, drama, comedy, and romance, the film was a delight. 4 out of 5. Eila, Rampe and Baby Girl (Eila, Rampe Ja Likka, Finland) was, I suppose, the Scandinavian idea of a screwball comedy. Unfortunately, it played more like an extended sitcom. There were a few laughs but those were far outnumbered by the many embarrassing moments that had me squirming in my seat. It might have helped to be Finnish, I suppose. Rated 2. 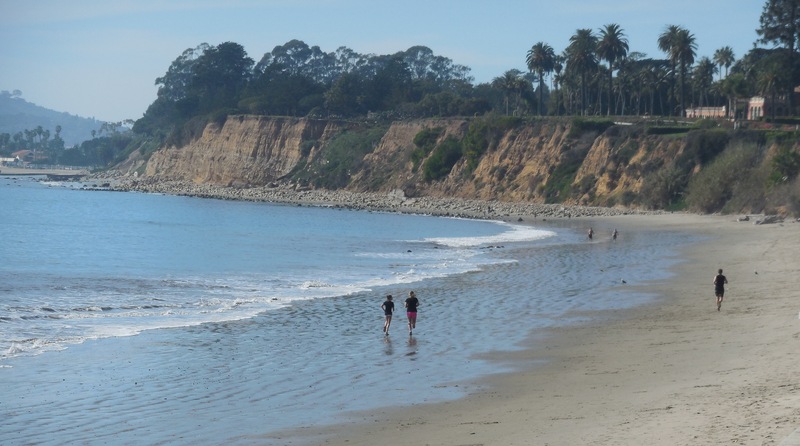 My flight is getting ready to load, so I have to sign off and resign myself to an icy, snowy future, warmed only by memories of Santa Barbara. Oh, yeah, and the love of friends and family who await me. It ain’t all bad. The fighting, it seems never ends, even when the fighting ends. Although David Gates has a good point when he sings, “…an argument can be outta sight, when you love to argue and you know how to fight”, I’m afraid we don’t know how to argue or fight well these days. What start out as discussions invariably degenerate into name-calling spite-fests. That’s a whole ‘nother area of discussion (and perhaps an argument) that I described in some detail in this post from a few years ago. Good old-fashioned paper books are better than e-books. Now there’s a religious argument if ever there was one. It’s about as pointless as Archie and Meathead’s argument about the order of putting on shoes and socks. There is no right and wrong here. It’s pure opinion. My own personal preference depends on the context. 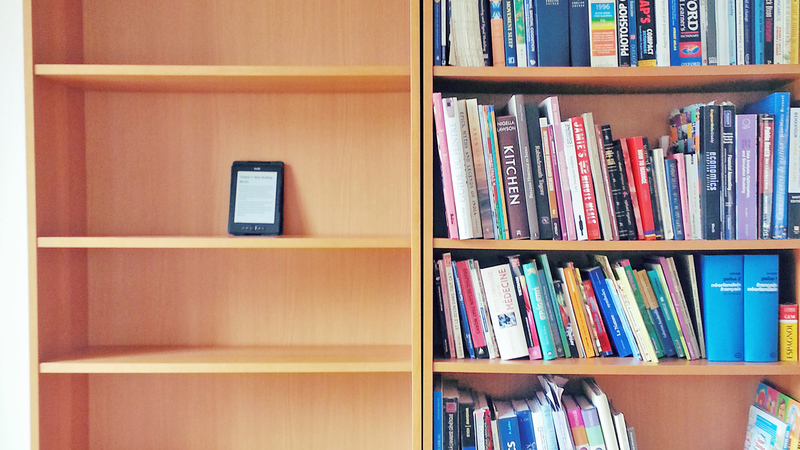 If I’m traveling, I can load more books on my Kindle than I could fit in my luggage. Additionally, most traditional books are impossible to read while both hands are otherwise occupied. Conversely, some books feel as if they were meant to be held in the hands. My copy of “A Soldier of the Great War” has a heft to it that matches the epic scale of the wonderful novel. It’s also signed. Try that with an e-book. Finally, there’s something aesthetically pleasing about a shelf or entire wall of books. Scanning the binders can be a joy unmatched by twiddling through the menus of a Nook or Kindle. Books are always better than the movies made from them. Hopefully no one has such a sweeping opinion. Anyway, it’s a specious argument for the most part. We’re talking about two different mediums: a mental one and a visual one. Your opinion may well depend on the way you process information. 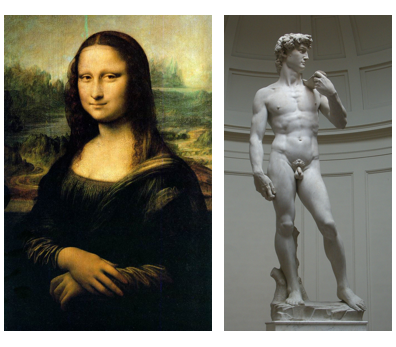 You might as well ask which is better, da Vinci’s Mona Lisa or Michelangelo’s David? Were the “Lord of the Rings” books better than the movies? It’s a moot point. The films were the vision of a small group of artists, Peter Jackson and friends. Who am I to say their vision is wrong or right? I love both creations for what they are. Note: “The Hobbit” films are a different story for reasons I expounded on here. Some books are rightfully considered unfilmable. Any attempt to do so generally leads to disaster. Cases in point from the not-too-distant past: “Winter’s Tale” and “Cloud Atlas”. Both were monumental critical and box-office failures made from monumentally fine books. There are a few movies I believe improved on their literary source material. One prime example is “About a Boy”. A good book, a better film, the final third of the story having been changed radically for the better in my estimation. Thus we’re talking about two different stories. Which is better? Again, personal preference. In this case, my preference is the movie’s story. You may disagree. These two arguments are carried on all over. They can actually be fun to argue about, if it’s done right. When it’s done wrong, we’re missing the point entirely. 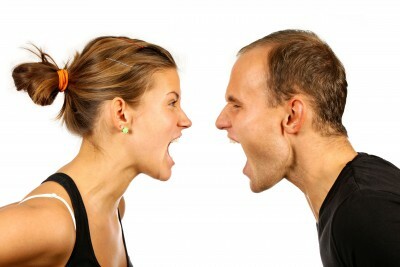 Needing to be right can kill relationships. There’s an infamous saying that almost brought down the American economy. “Too big to fail.” (I already wrote about this in my other blog here, but this post takes the idea in a different direction.) 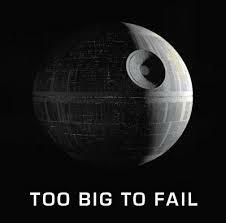 My own take on that absurd concept is, if something’s too big to fail, it’s too big. Period. Note that the statement is actually a lie. Nothing is too big to fail. Failing happens regardless of size. Just ask the Empire. My own preference is for small: small cars, small churches, small stores, small restaurants, small businesses in general. I’ve worked for big companies – I’m talking BIG companies – and small companies. There’s no comparison. For the most part, the big ones are hell, the small, paradise. My preference for the petite extends to movies and movie theaters. Yes, there’s a place for the blockbuster playing at the regional Imax theater, but it’s a small place. (That shouldn’t surprise you.) This was brought home to me in the most tangible way possible this past week. I saw BIG movie in a BIG movie house. A few days later I saw a small movie in a cozy little theater. The former was torture, the latter a joy. For my money, the more important contributors to movie quality consist of things like the following: Consistent characters, cohesive story, and humility of length, all in short supply in Interstellar. When the credits finally, mercifully rolled, I realized I’d forgotten it had been directed by Christoper Nolan, a man who specializes in BIG, at least since “Dark Knight”. So I hated the BIG movie, with its physics borrowed from Madeline L’Engle, interviews stolen from Ken Burns, and everything else taken from Stanley Kubrick. And the venue? There’s nothing to like about Generic Cinema 1-2-3-4-5-6-7-8-9-10-11-12-13-14-∞. 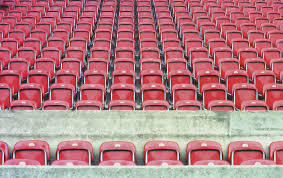 Take a seat, any seat at all. Luna in your living room. Which looks like a more enjoyable way to see a movie? The movie I saw at Luna was small. It was about people, not aliens – ideas, not bombs – real places, not CGI landscapes. Most movies happen to you. I like a movie I can settle into. There’s a place for both in the world, but not in Generic Cinema 1-2-3-4-5-∞. I don’t think there’s a place for me there either. * Publicly criticizing a Christopher Nolan movie, I’ve come to find out, can be hazardous to your health. When I made disparaging comments about “Inception” in this post, I was taken to task with a profanity-laced harangue from someone who must have a degree in Missing the Point. I expect to hear from the same guy this time, with his master’s thesis in Cluelessness. According to the blurb on the DVD cover, the film was “Astonishing.” As it turns out, the only thing about the movie I found astonishing was that it got made at all. Surprisingly, the “actual events” that inspired the story were more horrific than the ones actually portrayed in the movie. More often than not, the opposite is true. Otherwise tepid events are typically sensationalized to titillate potential viewers. That should give you an idea of how grim these particular “actual events” were. First, when is a true story not a true story? Is it fair to sell fiction as fact? The Academy Award winning best picture of 2012, “Argo”, brought this question to the fore. It was publicized as, “Based on the declassified true story”, but it was more fiction than history. How discerning is the average moviegoer? From my perspective, not very. Therefore, in a very real way, we’re rewriting history. Then, is it fair to review a movie’s content versus its quality? I’ve seen plenty of weak movies that tell amazing stories ripped from headlines or history books. Great story, mostly because it was great in real life. The movie, not so much. Still, these are worth watching. One good example was a biopic (probably heavily fictionalized) about Cesar Chavez, a man whose story should be more widely known. The film was marginal, but it was important to see because I regularly need to be inspired by great – and real – men. That also brings up the question of whether the moral content of a film should be included as part of its review. In today’s political climate, a racist film would almost certainly be trashed, as it should be. Yet misogynistic films and TV shows seem to be proliferating without much resistance. One could legitimately say that the moral judgment of a story is dependent on the morality of the reviewer. But doesn’t the reviewer’s bias come into play in any review? If every reviewer agreed on every movie, we could eliminate personal prejudices as a factor. 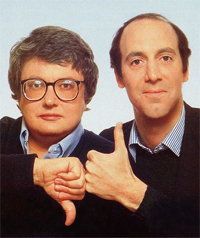 But then we would never have had Siskel and Ebert arguing about the direction of thumbs. What fun would that be? So then, of what value are critics’ opinions? Probably none at all, except in those rare cases where all the critics seem to agree. But even then, if I’d listened to that unanimity, I’d have missed out on some films I consider terrific. (Call me weird.) Worse are the films I’ve seen because the cognoscenti decreed them great and they’ve left me feeling like I needed a good scrubbing afterward. Unless you have a particular reviewer whose opinions always align with yours – Ebert was one who came closest for me – you’re pretty much on your own. Like me, be your own best critic.